I got my Apple watch just before leaving on our adventure and now I have had 3 months to play with it. I love the watch, but like all items it has strengths and weaknesses. Below is a list of what I think the Apple watch does well and what it could improve upon. Exercise- it wants to see you do 30 minutes of exercise to complete the “green circle”. It watches for anything at a brisk walk level and gives you credit. The 30 minutes can can be broken into small chunks of exercise throughout the day. You have the ability to record activities as exercise as well- I will go into that further down in the review. Calories- When you set up the watch it asks for your height, weight, age… and then your current activity level. It then gives you a goal that you can adjust at any time. Your progress with your calories burn for the day is displayed as a red circle. I like that it measures calories and not just steps. I find I need way more than 10,000 steps to complete my red circle for the day. Standing up- The final circle is blue and you complete it by standing up 5 minutes out of each hour for a total of 12-hours per day. This would have been extremely helpful back in my old job. The watch reminds you when it’s time to stand and lets you know if you complete the goal for the hour. The watch gives you updates throughout the day on how you are doing. You get weekly updates at the end of the week with a chance to change your goals at that time. 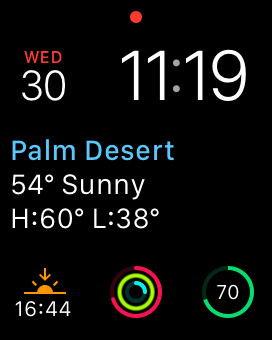 Information on multiple things at a glance: I love that the watch face is customizable and easily changed. 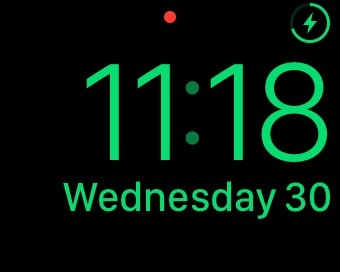 I am currently using the “modular” watch face in multiple colors I have customized it to have the time, date, weather in current location, sunrise/sunset times, activity progress and charge status. Some of these like activity and weather can be touched on to drill further down on information. In addition to what is on the screen you can easily access other information by swiping up (glances) or down (notification). Glances give you access to things like: heart rate, music controls, calendar. These are customizable. Notifications gives you access to the notifications you get on your phone. Speaking of notifications- you have full control over alerts and how much your watch beeps or taps you. I have most of my alerts off accept texting and phone calls. The other notifications appear in notifications but do not create a sound or tap. Apple Pay– We had been using Apple Pay since we got the iPhone 6. Apple Pay is even more convenient on the watch. You just double tap the button below the dial and put your phone near the card reader. You do not need your phone with you to use Apple pay. This is one of the things the watch can do without the phone near by. Exercise– In addition to tracking my daily move goals I can let the watch know I am doing a workout by using the built in workout app. This allows me to track a run, walk, cycle, elliptical, rower or stair stepper. In order to accurately “track” outdoor exercise you need to have your phone with you to track gps. I usually run with my phone, but I have found the step tracking to be pretty accurate on judging distance. I am usually within .1 on a 3 mile run. 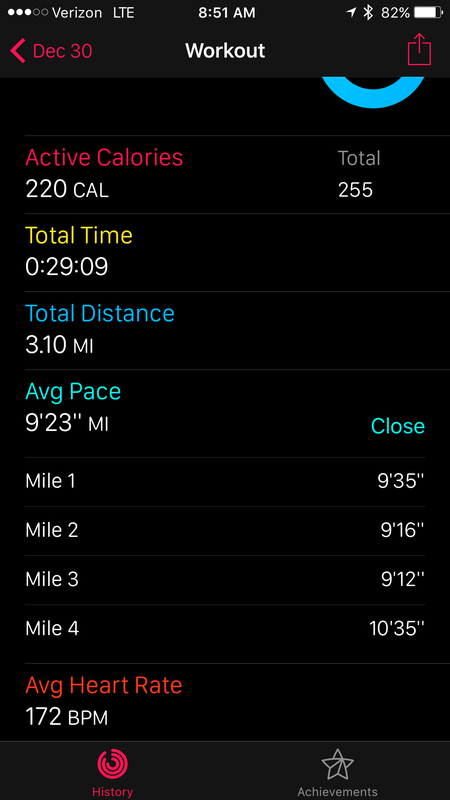 The app lets you look at your outdoor run time, it gives you the average rate you ran per mile and you can drill down into the splits to see what you ran each mile. This entry was posted in Lori loves her tech gear, Our Gear and tagged Apple iWatch, running. Bookmark the permalink. I need to learn how to be tech savey. Happy 2016!